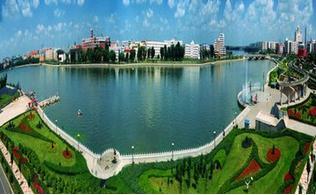 Location: Situated in the northwest of Heilongjiang Province, Qiqihar is the traffic hub of western Heilongjiang. It neighbors Jilin to the south and Inner Mongolia to the west. It is 359 kilometers (223 miles) from the capital city Harbin. History: As early as 10,000 years ago, the ancient people living on the banks of Nenjiang River created brilliant civilizations on the black soil. According to the archeological discoveries, it was 2,500 years ago that Qiqihar entered the highly developed Bronze Age. Qiqihar is the convergence point of the three ancient ethnic groups of Sushen, Donghu and Huimo because of the inter-cultural mixing and resettlement among them. Physical Features: The city is located in the Songnen Plain, and the terrain slopes downward from the north to the south. It lies at the south foot of the Lesser Xing’an Mountain (Xiao Xing’an Ling), and its south and central part are alluvial plains. Climatic Features: The area enjoys a temperate continental monsoon climate at a high altitude, the spring is dry and windy, and summer is hot and rainy. The autumn is shorter and the winter is chilly and long. The average temperature of a year is between 0.7-4.2C (33.3-39.6F). When to Go: Every year from May to July is the most favorable season to visit Qiqihar. Zhalong Nature Reserve: It is a famous nature reserve for bird fowl with an area of 210,000 hectares (2,100 sq kilometers). Reputed as the town of the cranes, it attracts two hundred and ninety-six species of birds in total, with the cranes being the largest in number. Bukui Mosque: Constructed in the Qing Dynasty (1644-1911), this mosque is composed of the west and the east mosques. It is one of the largest and most well-preserved mosques in Heilongjiang Province.